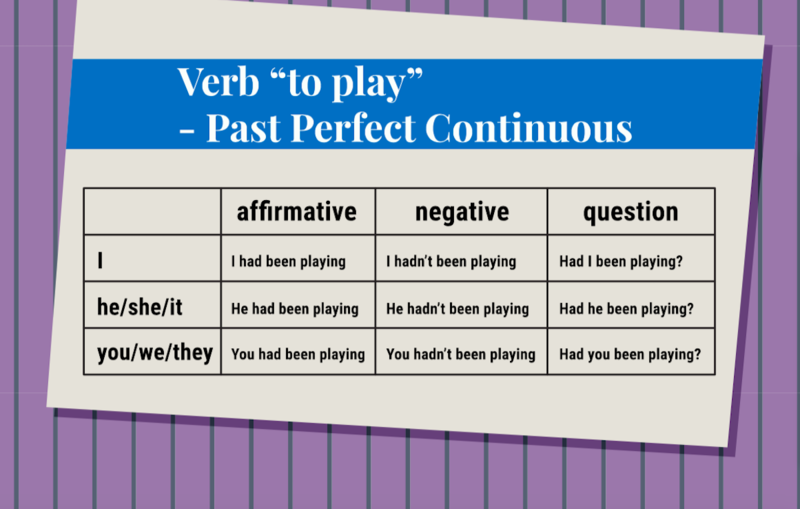 The present perfect continuous tense in English is used to connect the present with the past. It suggests that something was started in the past but is unfinished. In this posting I talk about how to form and use this tense. I also talk about how it differs from the present perfect simple. The download at the end will give you additional practice using the present perfect continuous tense. What is the present perfect continuous tense? 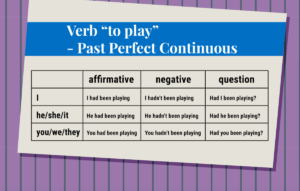 The present perfect continuous tense forms a connection between the present and past. It implies that something was started in the past but is not finished. It is still going on. How do we form the present perfect continuous tense? I have been cleaning my house all day. You have been cleaning your house all day. He/She/It has been cleaning her house all day. We have been cleaning our house all day. They have been cleaning their house all day. Has she been cleaning her house all day? Yes, she has. No, she hasn’t. Where have you been living the past 2 years? In Texas. I moved there 2 years ago. Hank has been playing the guitar for 5 years. Hank began playing the guitar (or learning to play the guitar) in the past–5 years ago. He still plays the guitar, and will probably continue to do so in the future. Julie has been reading her mystery novel for three hours. Julie began reading her novel 3 hours ago. She is not yet finished with it. She is still reading it, and will probably continue reading until she is finished. We’ve been watching a lot of football lately. We started watching football in the past. We have watched many football games, and we are still doing it. Perhaps we will probably continue to watch football games until the season is finished. John hasn’t been working very hard this year. John has not worked hard since the beginning of the year. He still isn’t working hard. Perhaps he will never work hard again. 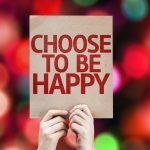 The present perfect continuous and the present perfect simple–which one to use? The differences in meaning between the present perfect continuous and the present perfect simple are often subtle. Often they mean almost the same thing. Both focus on an action that was started in the past. In the case of the present perfect simple, the action may continue into the future. The present perfect continuous focus more on the continuing action, or the process, and less on the results. Look at these example sentences. You will see almost the same sentence in both tenses. We will then explain the differences in meanings. Mr. Smith has written a book. He began writing a book in the past. He is no longer working on it. Mr. Smith has been writing a book. Mr. Smith began the book in the past. He is still writing it. 2. I’ve been painting my living room blue. The focus in this sentence is on the action of painting. I started painting in the past, and I’m still working on it. I’ve painted my living room blue. The focus here is on the results–my blue living room. I am no longer painting. I finished painting. 3. I’ve been watching the video you recommended. I’m somewhere in the middle of the video. I haven’t finished watching it yet. I’ve watched the video you recommended. I watched it over time, but I finished it yesterday. 4. She’s been answering her e-mails for 20 minutes. Again, the focus is on the process. She is not yet finished answering her e-mails. She’s answered her e-mails. The focus is on the result. She is finished answering her e-mails for the day. 5. I’ve worked in the south office for 10 years. This is the present perfect simple. I began working in the south office, and I still work there. Usually I work in the south office, but I’ve been working in the north office for the past 2 weeks.The first part of the sentence (in the simple present) talks about something that is permanent. 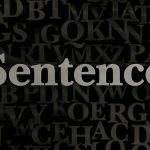 The second part of the sentence (in the present perfect continuous) shows a temporary situation. I’ll be back in the south office again soon. 6. How long have you been living in California? I’ve lived in in California since 1982. I’ve been living in California since 1982. In this case, both sentences mean the same thing. You now know that the present perfect continuous tense if formed with have/has + been + the ing form of the verb. We use it to talk about an action that started in the past and is continuing into the present. While the present perfect simple focuses on the results of the action, the present perfect continuous focuses on the continuing action itself. The download will give you additional practice using the present perfect continuous tense. You can download the practice sheet now! to be on the same wavelength –This means to have similar thoughts and feelings with another person. My best friend and I are usually on the same wavelength. It’s as if we can read each other’s thoughts. the blind leading the blind –This means that the leaders of an organization know very little about the work they are doing–maybe even less than they workers they supervise. I don’t know much about what I need to do in my new job. The boss doesn’t wither. In fact, he knows less than I do. It’s the blind leading the blind.